I have been back in California for a month. I cannot even begin to tell you how difficult it has been to get back in the swing of it all. I seem to have been surrounded by an enormous, blanketing fog, a fug even. I can’t see anything, I can’t do anything, everything just seems different, a blur. After I had been back in Ca for just about a week I was driving down Sir Francis Drake Blvd into our small town when it struck me, where are the ladies collecting cow dung to fire up the cooking for their evening meal, where are the endless smells, some good, some really really bad, where are the bright colored clothes, saris, turbans, where is the endless din, traffic, horns, shouts, where are the tuk tuks, where are the Holy cows? Why is there nothing to see, no jaw dropping forts, no endless vistas stretching away to the horizon, no sand, no dirt, no dust, no crowds and crowds, ha, no heat even? There is not a pot hole within miles. There is hardly even a decent curry, unless I go to Berkeley. I can park easily, I can walk into a shop and know where everything is and what it costs. I am not the remotest bit scared. There is no chanting, there are no bells, there are no Temples to marvel at, no Muezzins calling the Faithful to prayer, there isn’t even a train whistle. There is no new town, city or village for me to explore tomorrow, not even a new street. I know what is going to happen next with crashing certainty, I even know where the next meal is coming from. I am not anxious about talking to people, or even not talking to people. I am not fixated with Internet accessibility concerns for emails, Skype or blog posting. I just about know where close family members are and what they are doing, up to the point where I need or want to know. Did I really ride a tuk tuk into downtown Vientiane, did I really take an hour’s ride in a sampan on the Mekong river in Phnom Penh, is it possible that I spent a week roaming the Western Ghats without seeing or speaking to another Westerner, did I really stand on the walls of the forts at Jaiselmer, Jodhpur or Udaipur, was that really Ankor Wat, Hong Kong ? But yes, I guess I did those things and more besides and now I am back, I know I am back as I just went on a lengthy walk (hike) with son the younger, he told me I was back ! Thank you Sebastian. People said very kind words about my blog posts and now that the fog is clearing I may take it up again, blogging that is. It is also interesting to note that my site is still getting some twenty or so hits a day, from all over the world, they can’t all be from my Mother! There are a number of events missing in my posts, I may try and cover them before the memory fades. Notably getting sick as a dog in London, of all places, after all that, I get sick in London, it was quite unpleasant and most embarrassing, I didn’t eat for a week and felt dreadful. There was a night in Lincolnshire that was uproarious, my thanks for the hospitality. I’m reviewing a number of posts that I wrote for my blog after returning to the West Coast, or the Edge as its sometimes known, but you know what, they all seem a bit whiney, wingeing even. Hope the above does not fall into that category. It’s been three months now since I returned and quite honestly I can’t sit still. Jump up every time a plane flies over, where is it, where’s it going, who is on it ? Why am I not on it ? 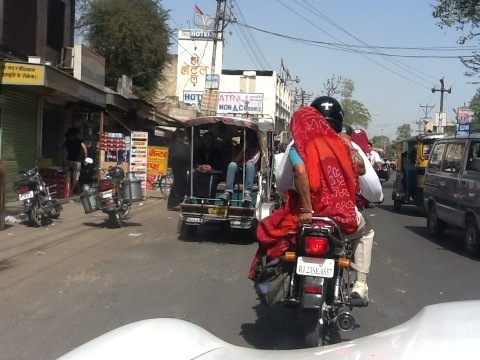 Saw a lady in town yesterday in full sari regalia, it’s the little things. Here I am, on the day that everyone seems to be planning to watch the Olympic Opening Ceremonies, OFF, outa here. In twenty four hours I hope to be checking into a(n) hotel in NAPLES. Wow. See you there or en route. 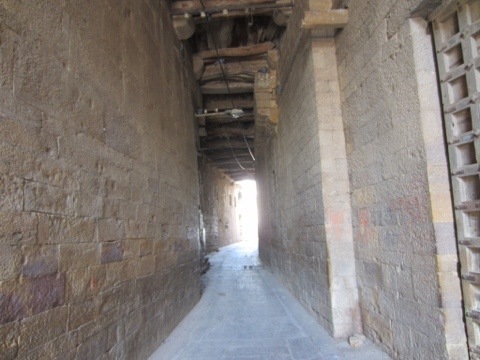 An average alley, wide enough for four warriors side by side. 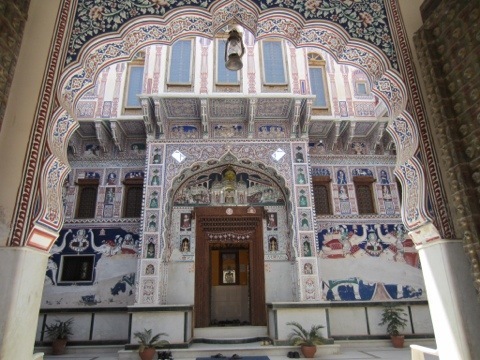 A Jain Temple in the town. 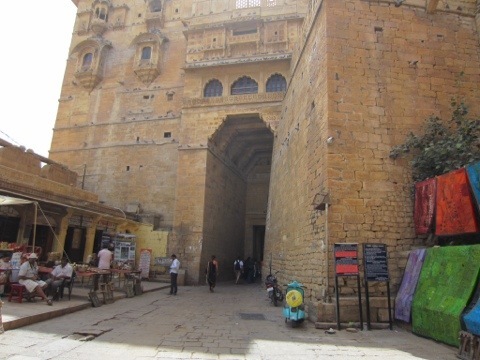 One of the three gates into the city. Far out in the desert the sandstorm rages on. Ok, I finally succumbed, stopping at the two hundred kms marker to take a photo, three tiny children sidled up and began cooing, rupees, chocolate. There we were, absolutely in the middle of nowhere, crazy Westerner is taking photos of a mile marker, I just had to, yes, I gave them money. Everywhere, absolutely everywhere you are told not to, it’s bad for them, it’s not PC, they will not go to school and instead end up hustling for chocolate and rupees at the mile marker. Well, I haven’t seen a building for an hour, well not one that you could call a house, so the chances of those little ones ever going to school is remote. Do I feel bad ? Yes of course I feel bad, for them, and a system that lets me ride around in a car, with a driver, and gives them nothing whatsoever. Oh the life of a bleeding heart, tree hugging, pinko liberal. Desperately searching for a reason to go on living I will say I raised big smiles on the faces of three children who live close to the two hundred km marker from Jaisalmer and maybe tonight they will be able to tell funny stories about the Westerner who took photos of mile marker. Last night’s hotel was a great success, I had a quick walk around the closed fort, looked in some shops, failed to find the craft market, had dinner and went to bed. At about four thirty I discovered the disadvantage of staying in a room on the top floor, it was just about adjacent to the towers of the Buddhist Temples of the city, consequently, when the amplified prayers began I almost fell out of bed. I don’t wish to sound disrespectful, it was very melodic, it’s just there were three temples in my immediate vicinity and others in the distance and they were not, shall we say, in sync. The prayers went on for about an hour and then the calls to prayer from the towers of the Mosques started. It was not exactly a restful night. 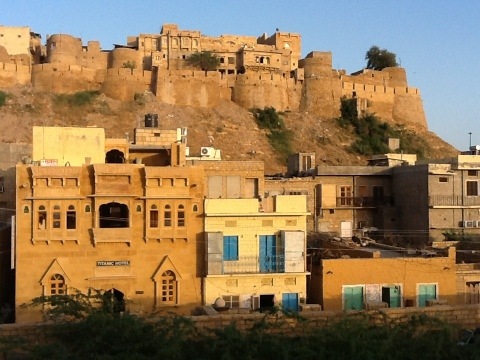 Undeterred, I was up early, grabbed a handful of breakfast and off on the high road through the desert to Jaisalmer. 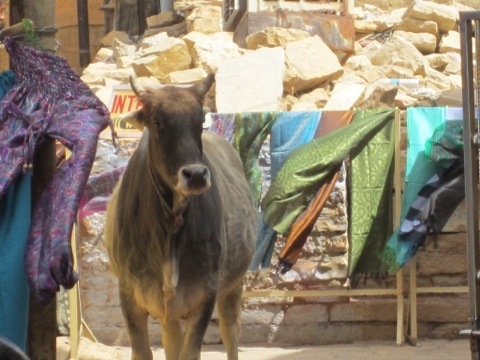 It is not quite like the archetypal desert, yet, it is sandy, yes, but trees manage to grow, goat herds survive, there are buffalo, cows and bullocks of course, camels and donkeys, and the occasional village. Desert colored, a bit drab to my eyes, dusty and isolated there is something remarkable to see in each and every one. The women ! Well their clothes anyway, you cannot see any part of them, they are so heavily covered and veiled, it’s the colors, the colours. Every color of the rainbow, and a few more besides, no two can possibly be alike, or even similar. Bright blues, yellows, pinks, turquoise, purples, orange, they stand out like beacons of light against the harshness. 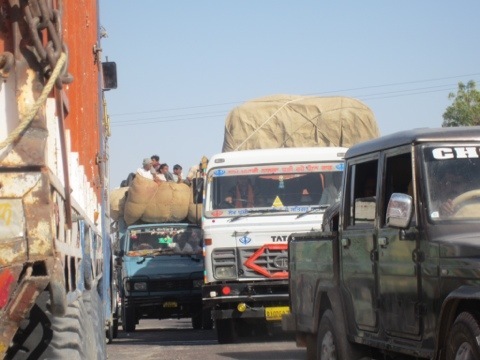 It’s odd you know, every time I see Rajasthan written on the side of a truck I say to myself, oh yes, right, Rajasthan, but even now I still half expect to see an Attenborough pop out from behind a tree, microphone in hand, proving that this is in fact a movie. There is another thing, Pakistan is just a few miles away. I received some concerned comments about the proximity of the border but I have to say we are in good hands. We have just passed through a tank convoy, seen the Border Guard HQ and a massive camouflaged encampment. Santosh also just commented that we are passing through an old nuclear testing ground. I am sure everything will be alright even if India did beat Pakistan in the cricket last night. We just passed a large number of anti aircraft guns lined up alongside the road, seemingly ready for action. One more thing, there was a sign inside the gate at the Bikaner hotel that read “Please do not ask for a commission”,puzzled I asked Santosh what it meant. He shrugged and feigned ignorance or lack of understanding. We stopped for lunch at a nasty place aimed solely at Western tourists,mine was so revolting I refused to eat it, how can a vegi samosa be disgusting! The daal and rice was ok, but to serve samosas with ketchup, in India, really people. 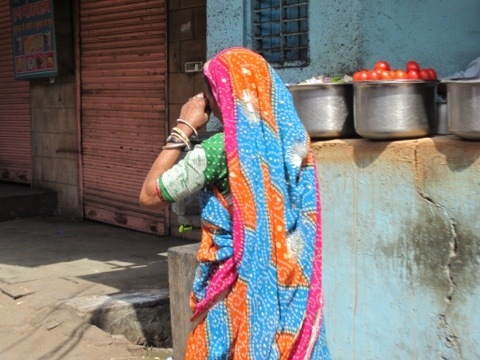 The point of the story: I remarked to Santosh that my lunch was inedible, and he said, I know, then looked very sheepish and started talking very fast about something else, incomprehensibly. The penny dropped, he rakes in a percentage of everything I spend, hence my lunch at the most expensive caff in the whole Thar Desert. What a hick I am, I won’t even start on the story about his friend who wanted us to come for tea, who just happened to own a silversmith shop. I just maintained my happy smiley face, but how many no thank yous do I need to say before I make my point. 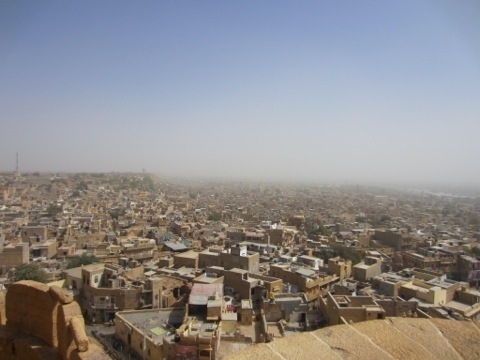 On to Jaisalmer, what a treat for the senses, the fort, containing the old town completely, dominates the surrounding plain, it burst into view ten kms out and is everything I could have imagined, maybe more so, it dwarfs last night’s fort in Bikaner. 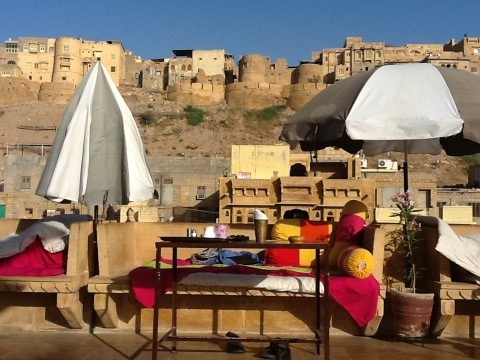 Fabulous sandstone walls, some crenellations, turrets, Havelis, little decks, verandas and terraces, some falling down bits and of course the occasional a/c unit and satellite dish. My hotel, for two nights, is ok thanks, my room faces the fort, it has a rooftop bar, restaurant, hangout space gaily done out in multi colored covered lounging big benches, more like beds in fact. It has the wifi. It has the chill techno music. It doesn’t appear to have any people. 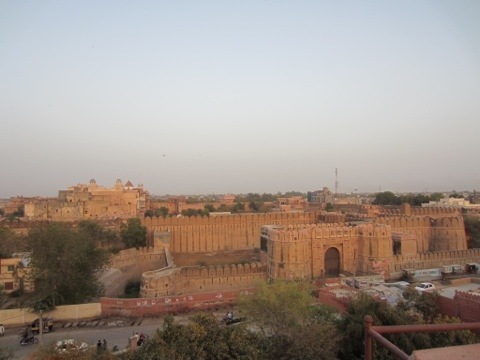 The walls of the fort soar up in front and the desert stretches out infinitely behind. 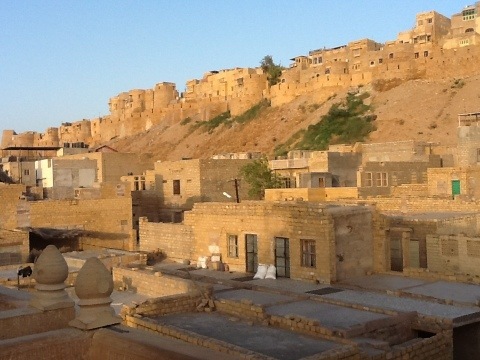 I am here, I made it, my ultimate Rajasthan fantasy come true and it’s better than I ever could have envisioned. My spot on the roof. The right end of the fort. The left end. There is a bit in the middle which you can see behind “my spot”. The road was quite crowded sometimes. Tagged Bikaner, Jaipur, Thar Desert. Well the best laid plans of mice and men…..trouble is that after Goa I hadn’t really made a plan, I thought I would just wing it, and that is what is happening. Although, I did book a train from Jaipur to Mumbai on the 26th in order to catch the Heathrow flight on the 28th while I was at home in Ca. I had this vague notion that I would just spend a couple of weeks nomading around Rajasthan, visiting the famous Cities of legend, Jaipur, Udaipur, Jodhpur and Jaisalmer by whatever means presented themselves, train, bus or whatever.Things went a bit awry with the camera saga, I really miss it and am perpetually frustrated with the inexpensive replacement, dreadful shutter lag. I keep missing shots and the features are just inadequate. Stop whining Tim. 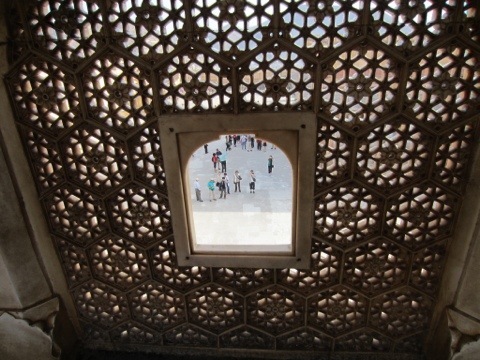 Ok. Anyhoo, I really had not planned a stay in New Delhi at all, everywhere I read I was advised to give it a miss, I thought I might just go from Goa straight up to Jaipur, this would have been better, but fate intervened and to Delhi I went. I can’t say I enjoyed it, I found it exhausting, everything was such an effort, nothing was easy, it was horribly polluted, the poverty was appalling, the juxtaposed display of wealth and decadence dire, the hustlers overbearing, wandering the streets and alleys I was constantly overwhelmed with offers of which I know not what, I assumed an unatractive aloofness, it was the only way to survive, horrid and cold tho it sounds. Not me at all. Sorry, just telling it like it is. I’m sure you know there is a temptation to compare, I can’t, I simply can’t think of anywhere that compares, even closely. New York in the 70s before the cleanup when it was so filthy and everyone was so rude, maybe. No, not really. Sorry Delhi. Let’s move on. 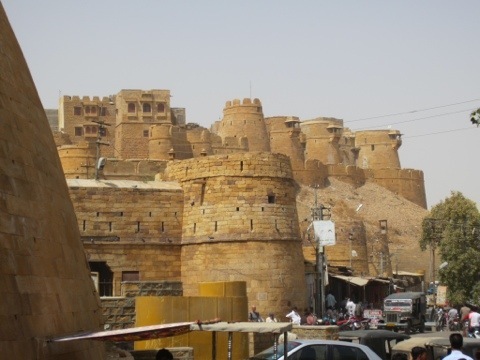 The nomading plan came to a crashing, ignoble end when I enquired at the hotel’s travel desk for a train ticket to Jaisalmer, calls where made, no dice buddy. 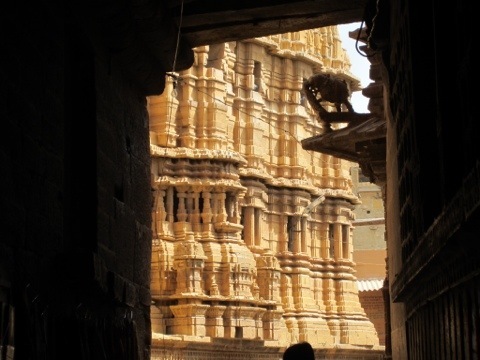 All Jaisalmer trains sold out for ten days, Udaipur and Jodhpur too. Well that certainly changes things. Hmm. I thought I would be smart and double check, tuk tuk trip to train station, where, through the hurly burly I did manage to determine that this was fact, though I could add myself to the wait list. Somewhat disconsolate I sat on a wall at the station reviewing the options, and watched the pretty ladies pass by! I can’t stay here for ten days, I could fly somewhere, though my destinations don’t have airports, so it would have to be somewhere different, Goa again ? Somewhere totally different, like a another country ? No, wait, I have a plan, let’s stick to it, A ROAD TRIP. 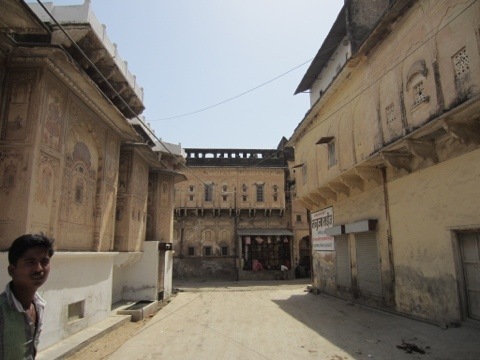 Inspired, I tuk tuk’d back to the Haveli, bounded into the travel office, well more shack really, and enquired about the possibility. Oh yes, they beamed, where do you want to go, where do you want to stay ? Fortunately I had done some homework and gave them the list of places I had highlighted in my book during a dull phase somewhere. While I was giving the guy the list there was another behind me, on the Internet, opening browser windows for each hotel and checking availability, smart operators these guys. Finished my list, much debating in Hindi, scribbled notes, a couple of phone calls, another gentleman was summoned, a car drew up outside. Finally head honcho says, write down how much you are willing to pay, I already knew so wrote it down, then he wrote a figure down and we compared. Ha, it was one hundred dollars different, in his favor.ok, I can live with that. Here is your driver, here is your car, when do you want to leave ? ! Whoa people, I only arrived a couple of hours ago from the horrible Best Western, today is Friday, how about Sunday. Sure, fine, no problem. So Sunday it is. 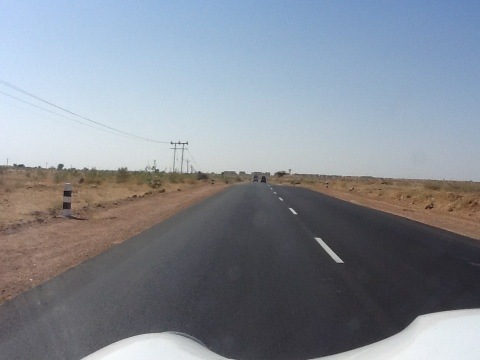 To the Great Thar Desert I go. Time to get the Atlases out. 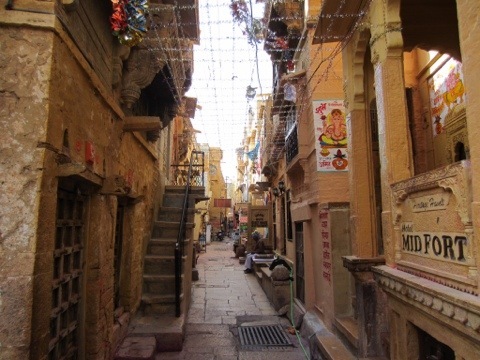 Amusing scenes in the old Haveli last night, I was quietly reading my book when a large bus pulled into the driveway and a motley crew of young persons fell out clutching shopping bags speaking with many tongues. They rapidly disappeared, re appearing minutes later dressed in their newly purchased finery. Wow, said I to one of them, glam night or what. Oh no she replied brightly, we are a group and this is our last night together. Turned out they were a G Group (Go India) with members from all over, Denmark, Sweden, France, Norway, Australia etc. 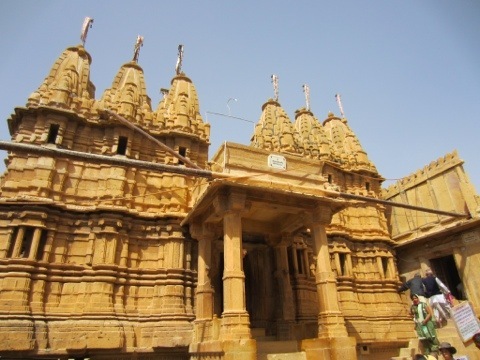 Go India seems to be quite a progressive tour group and interestingly offer LBGT friendly tours. Off they went in a multitude of tuk tuks and peace descended. Dinner was fairly decent and I got to chatting with a couple of Dutch ladies on the next table, they found my new pink scarf worthy of discussion, so it was that and this and eating and a beer. I left before them and took to a chair in the wifi lobby. They joined me and they turned out to be a Mom and daughter, the Mom a goldsmith from Utrecht and she and her two sisters each have Ataliers, how exciting, always wanted to meet someone with an Atalier. I saw her jewelry, on her phone naturally, she saw wedding photos and the daughter went to bed. Turned out that they had been out bar hopping the previous night and had got so paralytic they had to sleep in the bar. Admirable. Then the G Group came back from their dinner and chose to sit with us, nice bunch of kids, about ten of them, but easy to talk to and no one tried to dominate, it was all very, um, harmonious. Everybody left for home this morning at five am. Loudly. The view from my chair. 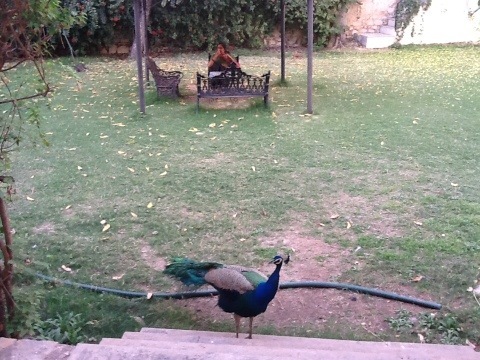 At the Bissau Palace Hotel, a Haveli in Jaipur. 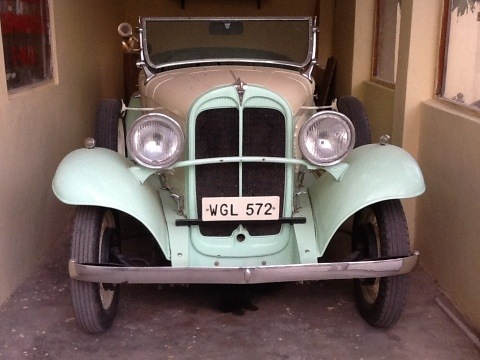 Car enthusiasts will recognize a Willys 6. The hotel will take guests for rides around the City. Meeting other guests on a terrace. A view from the unused Sunset Bar. Can you see those tiny dots in the sky? No, not splodges on your screen, they are kites. 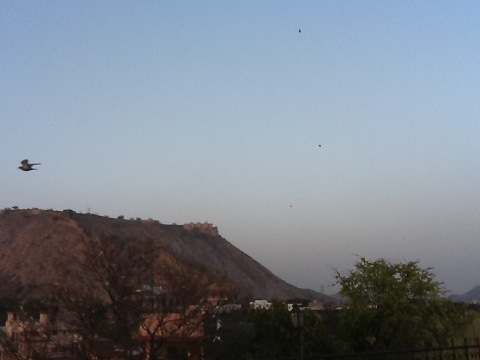 I had read about the Rajasthani affection for kites and tonight at sunset there were lots of them. It’s real, I am here. Tagged Bikaner, India, Jaipur, Jaisalmer. On Tuesday I flew from Goa to New Delhi and the difference in pace was like a catapult launch from an air craft carrier. Goa was just perfect, I cherished every moment. Goan food is exceptional, curry and spicy of course but not harshly so, fish abounds, lobster is almost a staple. No hang ups about beef either, there are burgers on the kids menus. 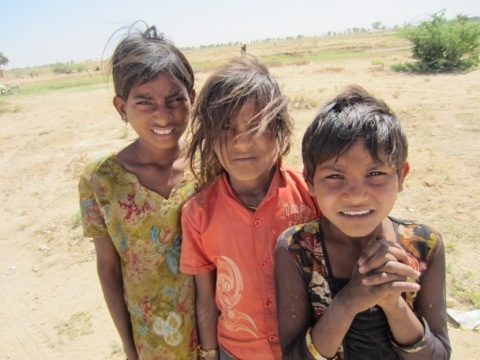 The Delhi dwellers were taking a few kilos home, frozen and packed in ice, they seemed delighted and so did the kids. Not sure about that, but hey, it wasn’t me beef smuggling, I was just the one who smuggled beer into the Tiger Reserve. The B and B ended up being a lot of fun, Simon, the owner, is a great guy tho, um, there might be some problems on the domestic harmony front I gather, plus he announced he was “going on the wagon” so I ended up hosting a dinner or two, lots of laughs with Brits from all over. At the communal breakfast one morning we were joined by a rogue ish looking type from Glasgow who had just got out of jail and had his passport confiscated by the Government so is Stateless. Happens a lot it seems, the passport confiscating, and the random twenty four hours to leave the country. The beaches of South Goa are worth the trip alone, very quiet, warm Arabian Sea, sand, beach shacks serving food and booze incredibly cheaply compared with other parts I have visited. But guess what, the Russians are taking over. In North Goa they have completely taken over two beaches and exclude any other Nationalities, they are setting up protection rackets with beach vendors and bars, even market stalls. This is having some affect on the flow of tourists, especially from the UK, who now steer clear of North Goa, preferring the South. 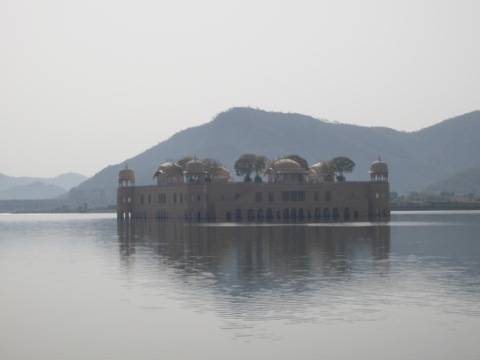 I had planned to leave on Monday, but alas no Internet all day so stayed an extra night in another tent, got up early Tuesday, booked everything and caught a noon flight to New Delhi. The aforementioned catapult. Even at the airport it was a maelstrom, I prepaid for a taxi but no one knew where my hotel was, least of all me. I lined up at taxi rank number five and showed my piece of paper to endless taxi drivers who just shrugged and rode off with the people behind me in the line. Oh this is great I thought the hick from the sticks, can’t even get out of the ……… airport. Eventually someone behind me in the queue took pity and told a driver what district to go to, off we went. Hair raising wasn’t in it. 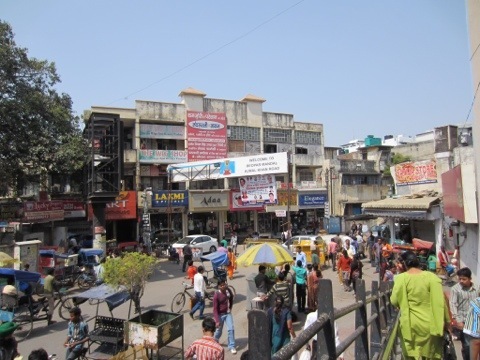 The Government has built a vast Metro complex throughout the city so negotiating the support pillars was a challenge, roundabouts, traffic signals, traffic cops,, all tried to cope with the vast surge of vehicles, mostly to no avail. Grid lock broke out constantly. 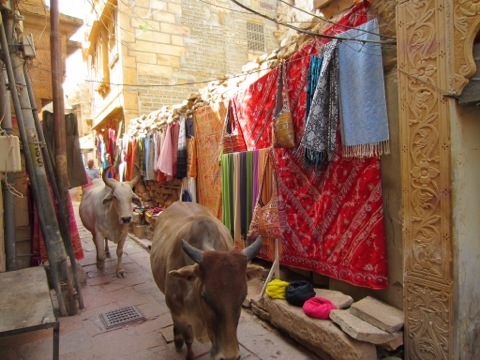 Squeezing through the alleys, constantly asking directions we eventually found it. Oh dear. My hotel, the Magnificent Palms, was a dump. Another dump. However I was on a mission, to get my camera fixed so off to the Canon Repair shop bright and early. They said they would see what they could do, in twenty four hours. Hmm. What to do, what to do. I took a train ride. I enjoyed it. Returned to Canon shop the next day and they wanted to charge me the price of the camera to fix it and it would take forty eight hours and, they pointed out, it is still under warranty in the US. Well, no brainer, took camera and left. Now what? 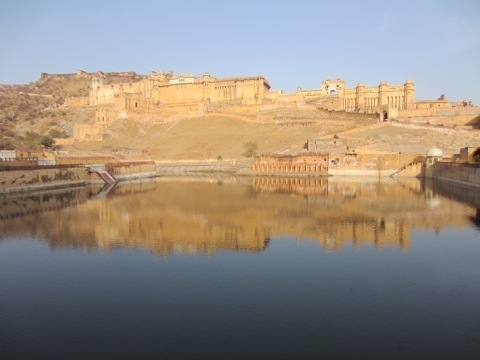 A six hour train to Jaipur, an eight hour bus ride? It was two o’clock and i was exhausted. Nope, I will splurge and fly. 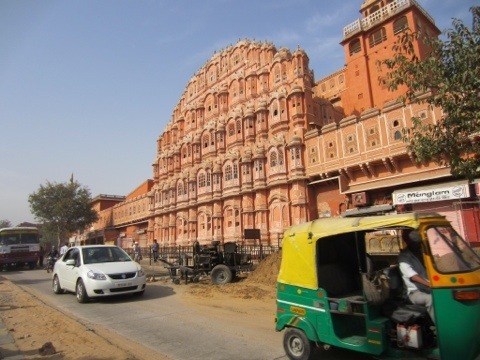 Spotted a travel agency across the street, took life in hands and crossed eight lanes of traffic, shades of HCMC, survived, and booked flight and hotel in Jaipur. 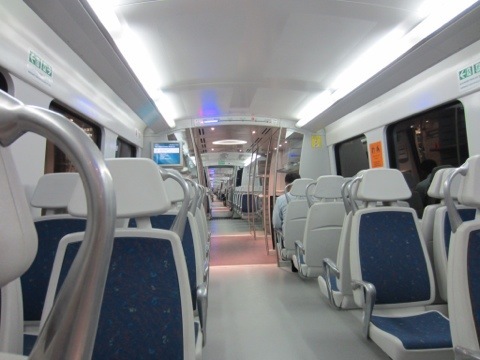 I took the new Metro out of the City, oh gosh, oh wow. Absolutely state of the art, security fell about laughing at my gadget jacket, took everything out and stared incredulously at all the contents. It reminded me of a cross between San Fran’s BART and that new London underground line. Ultra swish, chrome and flashing lights, it even had a progress bar (vital to computer nerds) showing our position. The announcements included “mind the gap”, a direct crib from London’s tube, if you are not familiar with that you may have seen it on a t shirt. 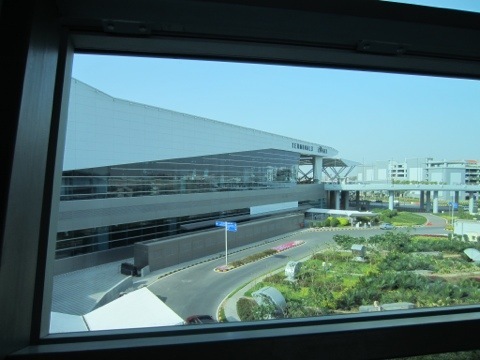 Terminal three at Delhi Airport is a real treat, voted second best in the World it it is a wonder of modern architecture. I was in awe. (as an aside, I just received a comment that I take too many photos of buildings!). I think I gaped, stood still, talked to myself, took pictures, enjoyed it. Off to gate seventy two, that is 72, and still it went on after that. The announcement at the end of the moving sidewalk said “feed the hungry and watch your step” which I think is noteworthy. Off in a little plane for the forty five minute flight, time for the first few sentences above and then we were down again. A first for everything and on disembarking the plane we had to show our boarding passes. 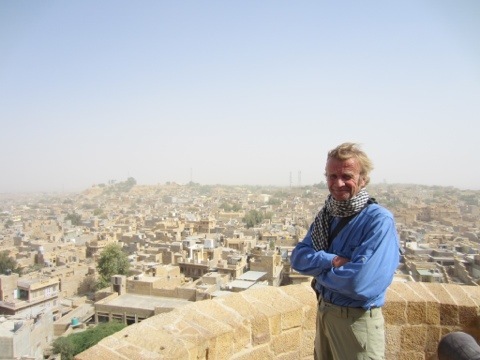 Here I are in Rajasthan, it’s a bit like what I expected, history at every turn, fantastically dressed people, bright clothing, sandy crags in the background, hill forts on the crests, dust, food smells, camels, elephants (poor things), begging children, Holy men, oh, and for the first time more people on the roofs of buses than within. Turbaned, bearded tribesmen from the distant mountains, looking fierce, and , well, a bit romantic. Oh no, my hotel is another dump, dammit. It’s a Best Western, really it is, with a revolving restaurant on top, it’s hell. 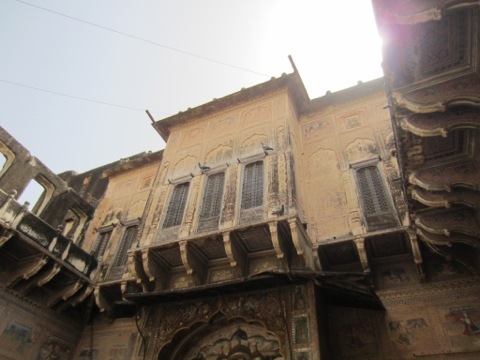 Hailed a tuk tuk to dinner in a Haveli, a spruced up old Palace, terribly tasteful, lawns, trees, peace and tranquility, good food, pleasant people. I vowed to move hotels, and I did. Woke up at dawn and took a tuk tuk (!) 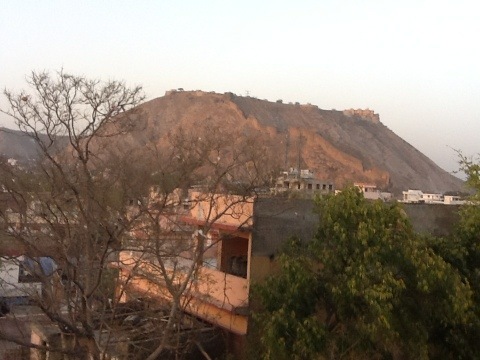 up a hillside to the Amber Fort. If one could ignore the crowds, the affluent ones in an elephant procession up the mountain, the hustlers, the noise and dirt it was absolutely marvelous. 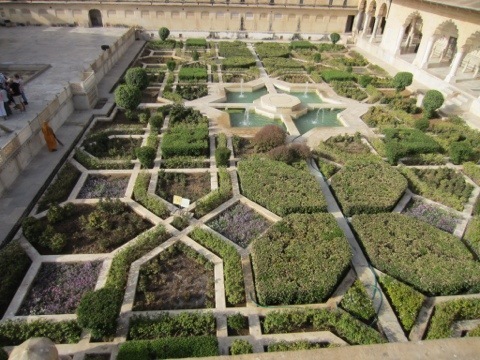 It is huge and dominates the skyline with fantastic walls, think China, minor forts along the way, landscaped lush gardens, fountains, the harem area with it’s latticed windows, it was worth the early start. An Ali Baba type experience. 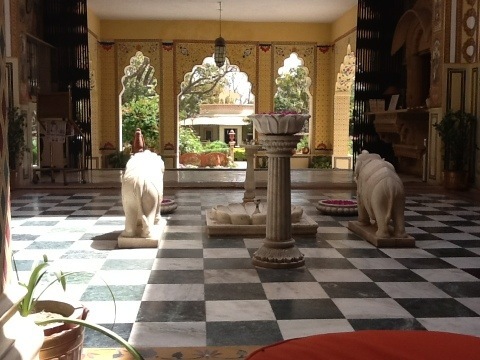 Back to the horrible Best Western, checked out and am now on the Terrace of another Haveli, writing this, tea brought round, there is a pool, it adjoins the walls of the old city and is half the price of the horrible Best Western, go figure. I am off to explore, will add photos later so check back. 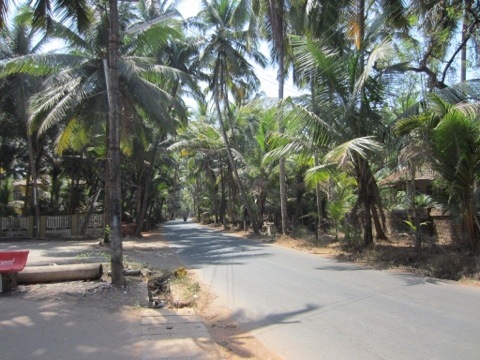 The quiet roads of Goa. The Russians are coming, the Russians are coming. 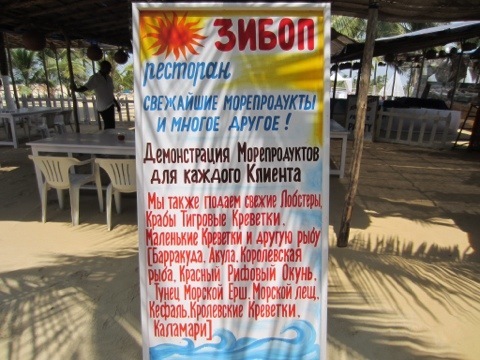 A menu in a beach shack. Just a tiny corner of Delhi. Bad Craziness. Taken while waiting my turn in the mobile phone shop. 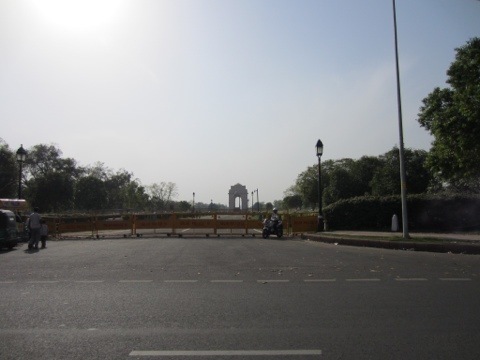 India Gate, New Delhi. 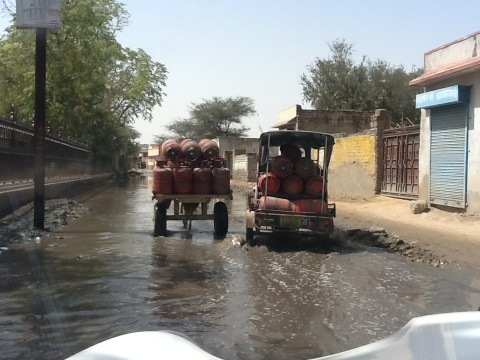 Taken from high speed tuk tuk. 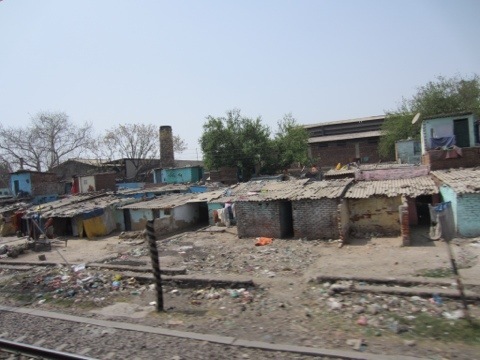 The slums of New Delhi went on for miles and miles. I never could have imagined. Terminal Three, New Delhi Airport ! No, I didn’t include it just to annoy you. Deep in the Palace there was this. Incredible. This looks quite nice, perhaps out of my price range. 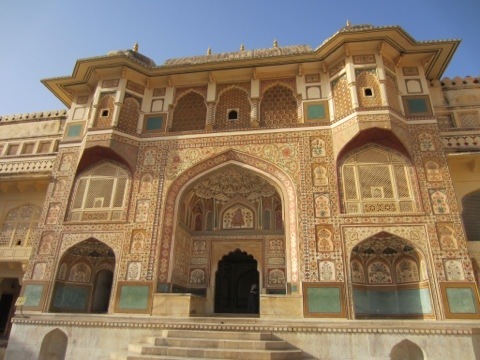 Jaipur, also known as The Pink City.